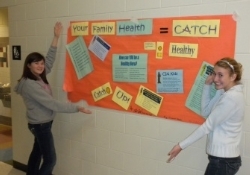 "Making the Healthy Choice the Easy Choice"
AISD participates in the Eat Smart program of the Coordinated Approach to Child Health (CATCH) program. AISD school menus meet the standards of CATCH providing mostly "GO" foods, some "SLOW" food and only rarely "WHOA" foods. Lunch menus are designed to meet one-third of the Recommended Dietary Allowance of middle school students for calories, protein, iron, calcium, Vitamin A and Vitamin C. Averaged over a week meals also contain less than 30% of calories from fat and less than 10% calories from saturated fat. Efforts are made to increase fiber by providing whole wheat breads whenever possible and serving fresh fruits and vegetables daily.